On these coins is a symbol ( ) which represents the workshop of the Fabrica Nacionale de Moneteda y Timbre de Madrid. 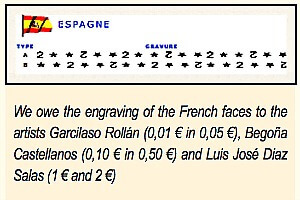 To conform to the new rules on the subject, Spain decided to adapt the national face of its coins, from 2010. The former coins remain valid. Spain, in long shape, the Kingdom of Spain, is a country of Southern Europe and, according to the definitions, western, which occupies the largest part of the Iberian Peninsula. In 2015, the country counted 46 million inhabitants, what made it the twenty-eighth country for the world as for the population. Spain is lined by the Mediterranean Sea in the South and by the East, with the exception of the British territory of Gibraltar and the strait of the same name which separates the European continent of Africa. In the North, Pyrenees constitute a natural boundary with France, Andorra, and Bay of Biscay. Portugal and the Atlantic Ocean line the West and the northwest. The Spanish territory also includes the Balearic Islands in the Mediterranean Sea, the Canary Islands in the Atlantic Ocean off the African coast, and two autonomous cities in North Africa, Ceuta and Melilla, bordering of Morocco. With a 504 030 km surface ², Spain is the most vast country of Europe of the West and the European Union after France as well as the third of Europe behind Ukraine and France without counting the European part (according to the definitions) of Russia. Because of its location, the Spanish territory was the object of numerous external influences, often simultaneously, since the prehistoric times(weathers) until the birth of Spain as country. Conversely, the country was itself an important source of inspiration for other regions, mainly during the modern era, when it became a colonial empire which left an inheritance of more than 400 million Spanish-speakers to this day. Spain as country arose from the dynastic union in the xve century of two sovereign States, the Crowns of Castile and Aragon - themselves built throughout the Middle Ages by the union or the conquest of initially different political, cultural and linguistic entities, which find themselves in the multiple historic nationalities recognized by the current Constitution of the Spanish State - and of the absorption in 1492 of the Kingdom of Grenada(Granada) and in 1512 of the iberian part(party) of the Kingdom of Navarre. This set(group) becomes a unitarian State in 1715-1716 by the dissolution of both Crowns in application of the decrees of Nueva Planta. The Spanish catholic Monarchy, which possesses then an immense colonial empire, is, of the xve at the beginning of the xviie century, a political and economic major power. She knows in particular an important cultural brilliance in all Europe during the Century of Spanish gold (xvie century-xviie century). The Spanish influence declines afterward, particularly throughout the xixe century and at the beginning of the xxe century with the loss of its colonies, the rise of the nationalisms and the multiplication of the political, economic and social crises which peak with the Civil war from 1936 till 1939 followed by a long period of catholic pro-Franco, conservative, militaristic and national dictatorship from 1939 till 1975. 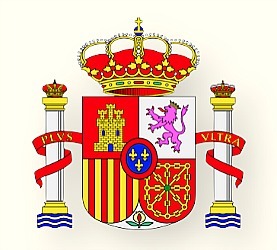 Following the democratic transition open to Francisco Franco's death in 1975 and to cultural movement which accompanied her, the Movida, Spain became a constitutional monarchy in the parliamentary democratic regime. It is a developed country endowed with the strongest ninth global economy by NOMINAL GDP (twelfth in purchasing power ratio), and of a "very high" standard of living (23rd in the classification IDH in 2012). 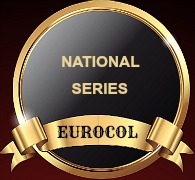 It is a member of the Organization of United Nations, the European Union, the Latin Union, NATO, OECD and WTO.